The UM 930 Twin is a special version of the UM 930 multipattern FET condenser. Both mics have twin large-diaphragm “M930” capsules; the difference is that the Twin provides a separate output (via 5-pin XLR) for each. Therefore, the UM930 can be switched among five pickup patterns, whereas the UM930 Twin can output two pickup patterns at once. The output from the front capsule is always a Cardioid pattern. The output from the back capsule has a selectable pattern — but the pattern is as seen from the front of the mic. As Gefell states, this microphone can record the same source with two pickup patterns, simultaneously, much like the Josephson C700A. 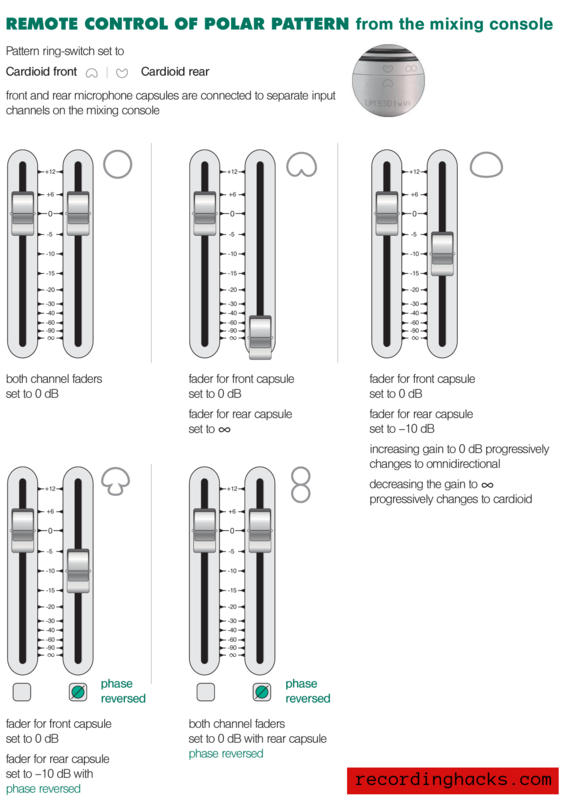 The behavior of the pattern-selection switch for the rear capsule is unusual, in that for four of its five patterns, it causes the output of the “rear” channel to be a mix of the front and back capsules. For example, when set to Omni, the “rear” channel would output the in-phase combination of the front and rear capsules’ outputs. When set to Figure-8, the “rear” channel would output the out-of-phase combination of the two capsules. Hypercardioid and wide-cardioid patterns can be achieved by similar combinations of the two capsules’ outputs, although the level of the rear capsule’s output is lowered — implying the presence of some sort of mixing circuitry within the Twin. For the fifth pickup pattern (Cardioid), the “rear” output will deliver only the output of the rear capsule. Curiously, this mode allows the engineer to produce any of the mic’s five pickup patterns in post-production — simply by combining the two capsules’ tracks at varying volumes and phase settings. For example, according to the Twin manual, a wide cardioid pattern can be produced by mixing the front capsule’s track at 0dB (unity) with the rear capsule’s track, in phase, at -10dB. The Twin documentation contains a graphic guide to reproducing all pickup patterns via the console. The approach of recording both Cardioid outputs separately actually provides more versatility than choosing a pattern via the mic’s selection switch, as infinite pickup patterns can be produced at the console by making slight adjustments to the relative volumes of the two capsules. As of January 2008, Gefell’s list price for the UM 930 Twin was €4350 (including suspension mount). The Microtech Gefell UM 930 Twin is also known as: UM930-Twin.